And Support the DHIA Scholarship Program! 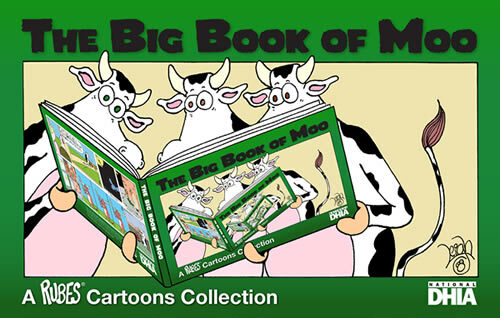 BOOK DETAILS: The National DHIA (Dairy Herd Information Association) is excited to partner with nationally syndicated cartoonist Leigh Rubin to offer this exclusive book. This beautiful full-color book will feature almost 300 Rubes® Cartoons, hand selected by the cartoonist himself, specifically for this project! Only a limited number of this collector’s item will be produced. Order yours today at $14.95! By purchasing this unique book, you will be supporting the National DHIA Scholarship Program. Established more than 20 years ago, this program awards scholarships to full time, incoming and continuing enrolled in two-year and four-year college/university students whose family is a member of National DHIA. Scholarships are also awarded to students enrolled in a college of veterinary medicine in the United States. Approximately 20 total scholarships are awarded each year.